Are you hosting a dinner party this spring and afraid its going to be too close to an Easter theme? Or having a wedding and not sure what colors to use? You've come to the right place! 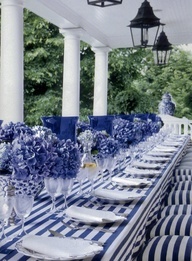 DME has some great pointers for throwing a gorgeous colorful spring event, wedding, or even just a dinner party. There are so many fun ways to incorporate color into your dinner table - you can do a combination of spring colors, use solo colors while still looking fresh, or even use your favorite color combos to bring a little of your own taste to the table! Another great way to spice up your dinner table is to personalize it using different accents, or even some fun games! By using solid colors for your flower arrangements, it can keep things looking simple and fresh! Although there are some other colors incorporated here, such as the white and blue stripes, and green glasses with the pink arrangements, its much more monotoned than using a mix of colors. Now, just because its more monotoned doesn't mean its boring! DME loves these fresh looks for a simple spring, or summer, themed table! 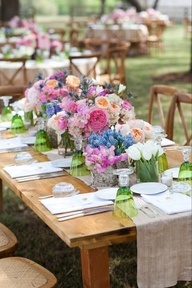 Using a combination of bright blues, pinks, greens and maybe even some yellow, will make your table breathtaking! Rather than using all your color in the centerpieces, incorporating it into the glassware is a fun way to spice things up. We all know how indecisive we can be when it comes to choosing color combos, so this gives you the option to use your favorite combos, even if they're not the springiest of colors. 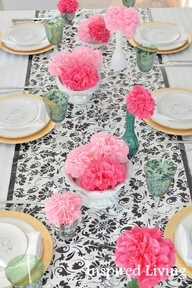 This is a great way to give your table a burst of color and will most definitely wow your guests! Using table accents is another great way to personalize your table. 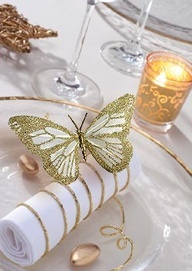 This butterfly accent is such a fun idea, especially with spring and summer right at our fingertips! Our favorite table accent here at DME is a dragonfly, what's yours? Think about it and hold onto it for your next event! It can be something personal to you, or it can be something to match the season, etc. Having a dinner party or a wedding where all your guests don't necessarily know each other can be challenging for a host or hostess. If you're throwing a dinner and you're having a few different groups of friends, having a fun trivia game or conversation starter game is a great way to break the ice! It will get and keep your guests chatting all night, and maybe even forming new friendships! If you're worried about where your guests will be seated at your wedding - stress no more. 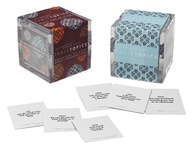 Rather than using just any trivia game, create personalized ones for your guests. They can be general trivia questions, a specific topic, or even questions related to your relationship, wedding, and honeymoon. This is not only fun for your guests, but fun for you to see their answers! Take notes - these are some great tips!